"A powerful religious leader will stop at nothing to put his candidate in the White House." John Provo investigates the death of a friend, which draws him into a conspiracy involving murder and the upcoming presidential election. He infiltrates the organization and enlists the help of an alluring young woman. But soon they’re discovered, and added to the “enemies list.” Now there is no turning back. They must somehow unravel the plot before election day—because if they fail, the new president will issue an executive order on day one to eliminate all threats—including John Provo and his new best friend. Deadly Commitment has not been tagged yet. Help others find Deadly Commitment by tagging it! Deadly Commitment has not been reviewed yet. 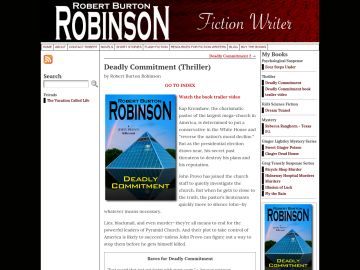 Deadly Commitment has not been recommended yet.